I like to think that I have a pretty good sense of humor. I like making people smile, smirk, and laugh and I try to do this in my posts whenever I can. Unfortunately I have a tendency to go a little (or in some cases a lot) too far. It is a fine line between funny and mean spirited and I sometimes cross that line. I think my filter, the one that most people have that tells them to keep your mouth shut, is a little leaky. My mouth, and now my posting, has gotten me in trouble before. My last two posts are cases in point. My last hiking post had a paragraph about the Aeroplane Inn in Honey Creek, IA. Looking back I said some pretty nasty things about a person and a place that I really had no right to say. I was called out on the mat by a commenter and, since he/she was right, I removed the offending words and apologized. I just wish I'd done this before I'd posted. The second instance was from my Walnut/Speeding Ticket post. I implied that I'd got the ticket because of the Wife. Nothing could be further from the truth. While I did worry about missing the kick off of the Wife's game, she repeatedly and cleared told me that she wasn't worried about missing it and that it didn't really matter. Didn't stop me from speeding and getting the ticket, events that were totally of my doing. As an explanation, but not an excuse, I composed both of these posts after I'd got my ticket. I was not in the best of moods and unfortunately I let this skew my judgment and writing. Next time I should cool off before I write. My sincerest apologises to both the Aeroplane Inn, its proprietor, and the Wife. When we lived in California, we had a favorite place to get away to when we just needed to get out of town - the town of Cambria. Cambria was an artsy place with interesting stores and restaurants. It was far enough ways that it took up the day to get there and back and the drive never seemed to disappoint. Now that we've moved to the Midwest we find ourselves Cambria-less and I, for one, miss it. So we decided to start looking for another Cambria. Our first try: Walnut, IA. We walked through several antique shops. In one the owner was giving out free homemade cookies and cider. A little kitten was hunting and pouncing on a dead leaf in the courtyard of the store. Too cute. And me without my camera. We ate some lunch at Aunt B's Kitchen. Good, in-expensive food served by someone who was very likely an Aunt and who's name may actually start with the letter 'B'. It doesn't get much more ... real than that. After lunch and a few more antique stores, we headed south out of town. I was going to take some country roads home instead of the interstate. On the way out of town we passed several wind turbines being built. Not sure how many but a few were numbered up in the 90s. Why Nebraska doesn't have wind farms, I don't know. Iowa, if I'm correct, is the third largest producers of wind energy after Texas and California. Wind turbines always look so majestic. And me without my camera. I turn west and we noticed something alongside the road. I stopped and backed up to see a flag flying next to a large B-24 bomber model on a pole. The props of the model were spinning in the wind. A plaque told of a mid-air collision of two B-24s near this point in 1942 and listed the crews that had not survived. And me without my camera. We made it home literally a minute before kick-off. The Wife is happy. Me ... I owe the state of Iowa $94.60. There goes the money I earned off my pictures. Poop. 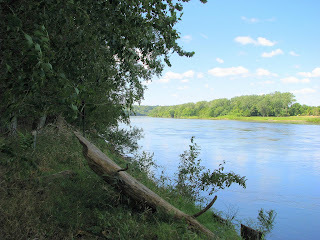 My latest foray into hiking took me for the first time into Iowa. A parent of one of the Wife's students, a former employee of the Western Historic Trails Center , recommended the Hitchcock Nature Center. 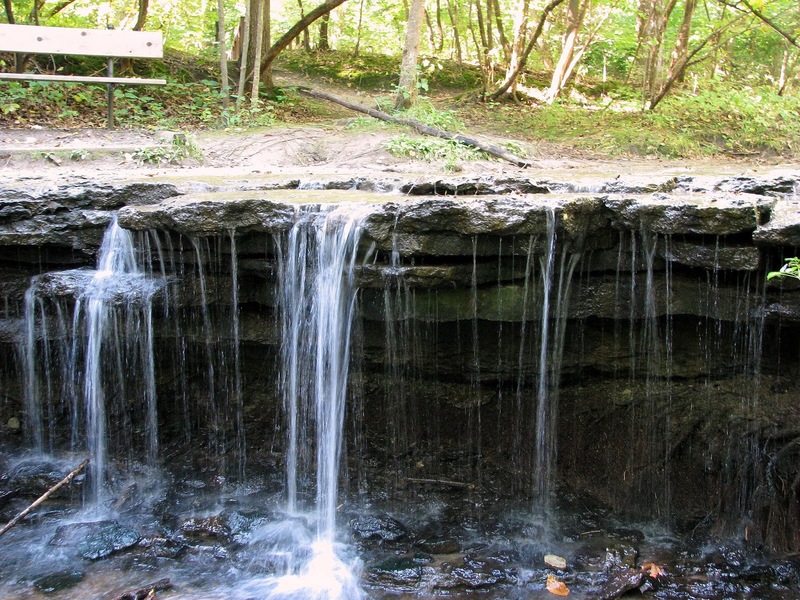 The park is located about 45 minutes northeast of Omaha and is located in the Loess Hills of Iowa. The Loess Hills are made of ... Loess , windblown sedimentary soil. The hills in eastern Iowa are some of the largest examples of windblown sedimentary deposits in the world. The Hitchcock Nature Center trails take you up to the top of some typical narrow ridges and into hidden valleys in between. The hike starts at the lodge. 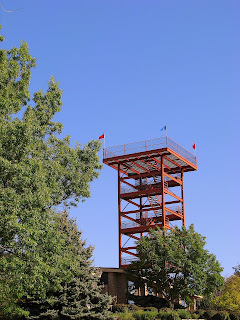 There was an observation tower similar to the one at Platte River State Park but I didn't climb it this time. I'm saving it for later this fall when the leaves change. The trailhead was surprisingly well stocked with trail maps. I often find these kiosks empty. I had a good idea where I was going as I'd studied the same map on-line the day before. I decided to join 6 different trails into a couple of connected loops. I left, this time well stocked with water and snacks, and headed out on the Fox Run Ridge trail. This trail, like all other trails in this park, are old, grass covered dirt roads. Actually, many of the trails were made by bulldozer by the former owner of the land who wanted to turn the area into a landfill. The trail follows the southwest side of a ridge and gives the hiker a great view of the forest and meadow land of the park. One interesting feature of this park that I did not partake in but I found interesting, were little orange signs with headphone icons placed along the trail. You can download podcasts ("Trailcasts ") to your MP3 player and get a guided tour of some of the trails around the park. The signs indicate when to play the next segment of the podcast. Since I enjoy listening to the sounds and silence of nature, I don't carry my MP3 player when I hike. Having said this,this seems like an interesting and cheap way to introduce people to nature. I left the Fox Run Ridge trail and followed the Dozer Cut off the ridge dropping down and connecting with the Bluestem Meander. (Meander - I love the sound of this word.) The Dozer Cut was a little muddy and covered in acorns, who yearned to be ball bearings, which made going down hill a little hazardous. The Bluestem Meander meanders through a meadow of tall grass. Meadows do not have to be flat and this one is no different as the trail climbed up and down the side of a hill. Up to this point I was very impressed with the well marked trails and the accurate trail map. The meander was supposed to connect up with the Hidden Valley trail. I reached an unsigned junction and mistakenly thought it was the Hidden Valley Trail. The unmarked trail, not on the map, took me back to the back gate of the park. When I reach the gate I realized that I'd been mis-guided. I backtracked to the junction and took the other branch which took me to a signed junction less than 50 feet down the trial. The map and signage were pretty accurate after that. The Hidden Valley trail takes you around the end of the eastern ridge and into a valley between tall, sharp ridge lines. The trail, covered in dead leaves and more acorns, follows a little creek/wash. At the Westridge trail junction I turned left and followed the trail on the other side of the creek/wash. Before long the trail makes a turn and heads straight up the end of the ridge. No wimpy switchbacks here. Straight up. It is a little reminiscent of Heartbreak Hill . The trail eventually levels off and follows along the rather narrow ridge that is common for Loess formations. The trail splits - one trail follows the top giving you a view of the Missouri River Valley, the other runs lower and on the forest side of the ridge. Both branches connect up to form a long and narrow loop. I took the right and admired the sweeping views. I stopped at one of the two camp sites (the cottonwood site), rearranged some logs into a semi-comfortable bench and rested. I cracked open some water and a protein bar. Further down the trail is the High Point camp site where the trail connects with the other ridge trail. I followed this trail back. This trail is a little more strenuous as it went up and down like a roller coaster but the views of the forest were spectacular. I returned to the main Westridge trail and walked back to a spur called, simply, the Shortcut. This steep trail connects you back to the Hidden Valley Trail. A left here takes you along a path through the middle of the narrow valley. This was probably the nicer part of the hike. The trail ends at a large American Elm tree. The clearing around the tree was lit with sunlight filtering through the tree canopy. Whenever the breeze would pick up, a rain of dead leaves would flutter down from overhead. A perfect setting for a picnic or something fun like that. There were a couple of trails leading off past the tree that I thought might form a loop but after reaching a dead end on one of the trails I figured I was wrong. 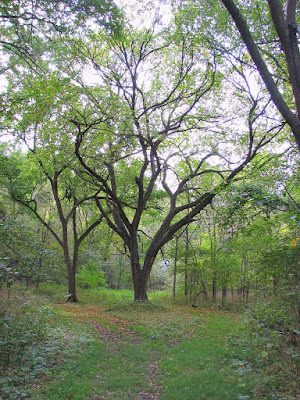 I returned to the clearing around the Elm and backtracked to the Hidden Valley-Bluestem Meander junction and followed the other branch of the Hidden Valley trail. The trails takes you through more forest and up a short steep trail before connecting with the Badger Ridge Trail. The trail goes up the ridge line, skirting the edge of the forest on the west, and offering a beautiful vista of farmland and hills to the east. There's a geocache along this trail but I decide to leave it for some other time. The Badger Ridge trail takes you back to the lodge. It was a very satisfying hike with interesting terrain and beautiful views. I really enjoyed it. By the time I'd reached the car, I was hungry. I stopped in nearby Honey Creek at the Aeroplane Inn to see if I could get some lunch. I pulled up and saw the For Sale sign next to the unlit Open sign. Thinking it was closed, I started to back out when the Open sign lit up. I parked and went in. The proprietor asked me if I'd thought it was closed. I said yes and asked if they served food. She said no ... or rather, only at night. I thanked her and left. I settled for Arby's instead. Pictures from the hike can be found here . The hike was 6.38 Miles with about 380 feet of vertical (once again done several times). Book: George R. Stewart's "Earth Abides"
I finished my fifth book of the year. Not the most impressive considering I haven't been working for the last 8 1/2 months and should have plenty of free time to dive into books. I think I'm a victim of cable TV and the Intertubes. Another thing that has happened this year is I seem to have a habit of clustering similar books together. Earlier this year I read "The World Is Flat " and soon afterward I read a similar book, "Three Billion New Capitalists: The Great Shift of Wealth and Power to the East ", that was a little less positive on the whole globalization thing but it was similar enough that I didn't even post about it. Another example was "The Road " and my current read, George R. Stewart's "Earth Abides ". Both "The Road" and "Earth Abides" tell the story of a post-apocalyptic world. "The Road" 's disaster is kept a mystery. "Earth Abides" 's begins with a virulent, flu-like disease that wipes out all but a handful of people. The main character, Isherwood "Ish" Williams is one of the survivors. He doesn't witness the chaos of the disaster as he is in an isolated cabin somewhere near his San Francisco home. The book follows Ish's trip across a dead United States and back before meeting a woman, Em, who becomes his wife. Soon afterward a small group comes together near Ish's home. The small group of seven adults grows in size as children are born. Stewart follow's Ish's vain attempts at keeping civilization alive. As time goes by and systems, such as water distribution, breakdown, Ish despairs as the group, known as the Tribe, lose more and more. Eventually Ish realizes that this is a loosing battle and decides to use game playing to give the future generation basic tools for hunting (Bow and Arrow) and gives up on the old trappings of civilization. While this could have been a dark, sad story similar to "The Road", it ends on a hopeful note. While the old civilization and all the knowledge that it was built upon is lost, the spark of a new one is seen being born. I found the book to be a little bland. It seems all too easy for Ish and the Tribe. I expected more challenges and interesting solutions. I find it a little hard to believe that over 20 years after the disaster, there is still edible food in cans and bottles. I would think that canned food would go bad long before then. The one thing that kept me reading is the interesting perspective of the author. "Earth Abides" was published in 1949. This is one of the older science fiction books I have read. It was interesting to see a glimpse of a world before the interstate highway system (Route 66!) and birth control. Every now and then I would ask why they didn't do something or other and then realize that it hadn't been invented yet. I think the 'niceness' of the book and the ease of the survival of the tribe is a result of the times the book was written. The war is over and the United States is the strongest nation. It is at the beginning of a very prosperous period. At the same time the horror of Nuclear War is beginning to raise it's head. Makes you wonder what the dark, depressing "The Road" tells of our outlook today. I've read better. I was surprised since many of the reviewers really liked it. I was entertained but it just wasn't exciting enough for me to recommend. I got excited a few weeks ago when one of my pictures was published. Well, now I've actually been paid to take some pictures. The amount I'm being payed isn't very much and I probably should have asked for more but I figured, being a beginner in this whole independent contractor business, I should just take the offer and ask for more next time ... if there is a next time. WCities sent a contract over and pretty much told me to change it any way I would like. I rewrote it with help from the Wife so that I would retain all copyrights and removing exclusivity clauses. They didn't seem to mind as they've transferred the funds via PayPal. It's nice to receive some recognition. Maybe I need to look into this whole professional photographer thing. Since I've moved back I have been looking for challenging hikes. My search hasn't been much of a success. Most of the longer hikes in the area are Rails to Trails projects which I imagine to be rather flat and dull. Of course, since I've never been on a Rails to Trails hike, I could be totally out of line. Anyway, in my search for a more challenging hike, I found Indian Cave State Park. I almost didn't choose this park as it was almost two hours away - a little long drive for an unknown park. I'm glad I made the trip. I picked up a map at the entrance and checked it out. I started adding up trail mileage to make a decent loop and before I was done I'd added up to over 10 miles. That was just what I was looking for. Unfortunately, since I didn't expect to find such a long trail, I was totally unprepared. I didn't have enough water having only 1 liter. I didn't have any food. I wouldn't have made a good boy scout. I settled for a shorter there-and-back along one of the longer trails called the Hardwood Trail, also known by the less poetic trail #5. The map provided at the entrance was surprisingly accurate. Trail #5 is a dirt (i.e. mud) and grass trail that winds up and down ridges through thick oak forest. To add a little variety I took a spur, unimaginatively named trail #5A, that left the forest and skirted two large grassy meadows before connecting back to #5. Once again, while hiking near a meadow, I was bombarded by grasshoppers. These trails hadn't been used in a while. On the way out I was constantly running into spiderwebs stretching across the trail. It was very irritating at times. At this point I would like to apologize to all the spiders whose webs I destroyed. I'd like to think it was just as bad for me as it was for you, especially when I destroyed your webs using my face. I didn't destroy all the webs with my face though. I did have the foresight to have my walking stick with me and I became quite skilled at the less well known martial art of Stick-Fu. Hii-Yah! Along with the webs, the trail was overgrown in some areas. I can't really blame the park service. In California it rained so infrequently that plant growth was stunted and trails stayed relatively clear. Here in Nebraska the rain promotes wild growth and I'm surprised the trails are as clear as they are. The trail gave me a workout. My goal was 6 miles. It turned out to be tougher than I expected. Not having hiked very much for the last three or four months seems to have effected my endurance. The humidity didn't help much either. My shirt was soaked in sweat by the two mile mark. I was getting near the turnaround point when I came upon a shelter. It wasn't time to turn around yet but I decided I'd had enough and I stopped at the shelter to rest. The shelter was a raised platform with three walls and a sturdy roof. The floor of the shelter was covered in bird droppings and what I think was bat guano. I broke into my first bottle of water at the shelter downing most of the half liter. As rested I had to fight off an aggressive butterfly that kept landing on me and a caterpillar that thought my leg was a tree or something. After a few minutes of resting and cooling off in the slight breeze, I started back towards the trailhead. I didn't see any animals (besides insects and spiders) on the hike. Tracks in the mud showed that there were a lot of deer in the area but I didn't see any from the trail. I also saw some prints that I thought were some sort of small cat since initially I didn't see any claw marks (cats retract their claws) but further down the trails I saw some indication of claws. I imagine they were either coyote or domestic dog. For those who want to see the pictures, I will have to disappoint since I took very few pictures on this hike, none worth posting. It was very beautiful and the sun filtering through the trees made for interesting views but these things usually don't photograph well. Also it's like photographing the Mona Lisa 100 times. Is the 100th photo any better the the first? Probably not. This hike was a good introduction to the Indian Cave State Park trails. There is quite a bit of the 3,399 acre park, including the location of the now defunct town of St. Deroin and the actual Indian Caves that gave the park its name, that I haven't visited. I'm pretty sure I will be back to tackle more of the trails and to learn more of the history of the area. Total miles was 5.83 with 545 feet of vertical (done several times as there were several ridges). 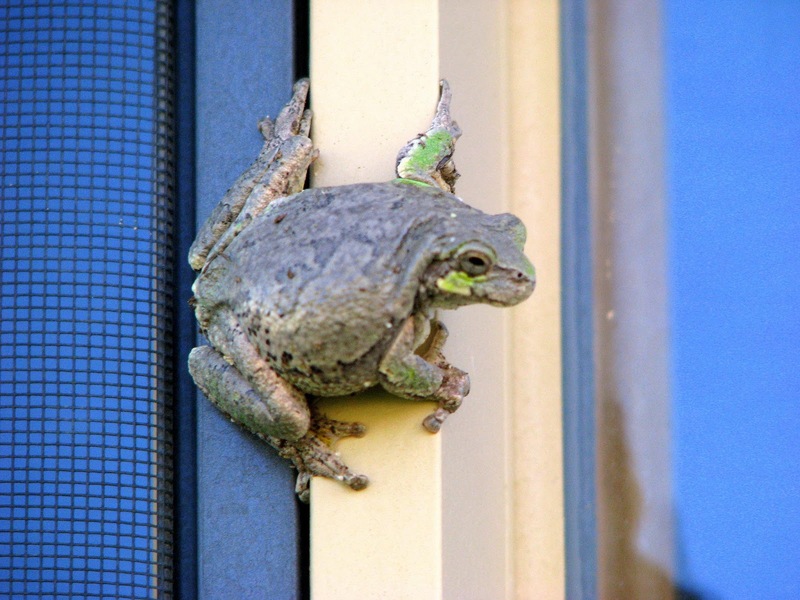 I discovered a peeping tom yesterday. I don't think he was a pervert. Actually I think he was a geek - he was peeking into our computer room. Just some updates on what I've been up to. The wife and I went to the farmer's market in the old Market area of Omaha. We ended up buying some dog treats (the Wife wanted to compare them with the ones she makes) and a really nice piece of pottery. Homer has already wagged his approval of the new dog treats. The pottery will be used for fresh baked rolls, I imagine. We walked down to Rick's Boatyard Cafe for lunch. The food was pretty good. That evening (Saturday) there was going to be a free concert there (I didn't go) and the pedestrian bridge over the Missouri, now christened the John Bob Kerrey Pedestrian Bridge after the senator who sent the pork, would be lit up for the first time along with fireworks. The pedestrian bridge will be open in a couple weeks. Can't wait to walk across it. We walked around the Heartland of America park and I took some pictures. 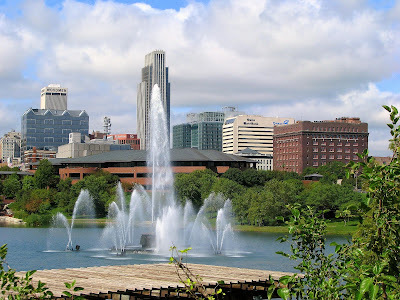 I added them to my Downtown Omaha Flickr Group. On Sunday we had one of the Wife's nieces and her roommate over for dinner. Being college students, they really appreciated the home cooked meal. We decided that we have to start doing stuff on the weekends. The Wife's new job doesn't create the homework that the old one did so we have extra time to do stuff. We just have to get-r-done. The jinx may be back. I went out to do some grocery shopping (We're have one of the Wife's nieces and her room mate over for dinner tomorrow night). I get home and look at the score - Notre Dame 21 Michigan 0. In the few minutes I took to unpack and put away the groceries, Michigan scores. I sit down to drink a soda and a Notre Dame pass is intercepted. I got the hint, grabbed a cookie, my book, and the remainder of my soda and went down in the basement (I was doing laundry too and that's in the basement). I found Homer wearing his Notre Dame Victory Scarf cowering in the tornado room - actually a storage room off the laundry room. He doesn't like the sound of the game or the cheering and clapping of the Wife. It must of worked since Notre Dame scored another touch down while I was downstairs. I guess I know my place on Saturday afternoons - anywhere except watching the game. Out of the house I was locked today. Grateful for neighbors willing to share their phone. Letting me in with my cold bare feet. Thankful for the Mom who had a spare set of keys. Note: At the end of the last hiking post I said I would next be hiking in Iowa in a Mormon themed park. Well, the park I was going to is closed due to tornado damage suffered this spring and won't be reopening until next spring. Plans change. 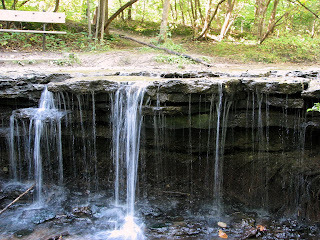 With the closure of my selected hike, I scrambled around Monday looking for an alternative and eventually settled for the nearby Platte River State Park. 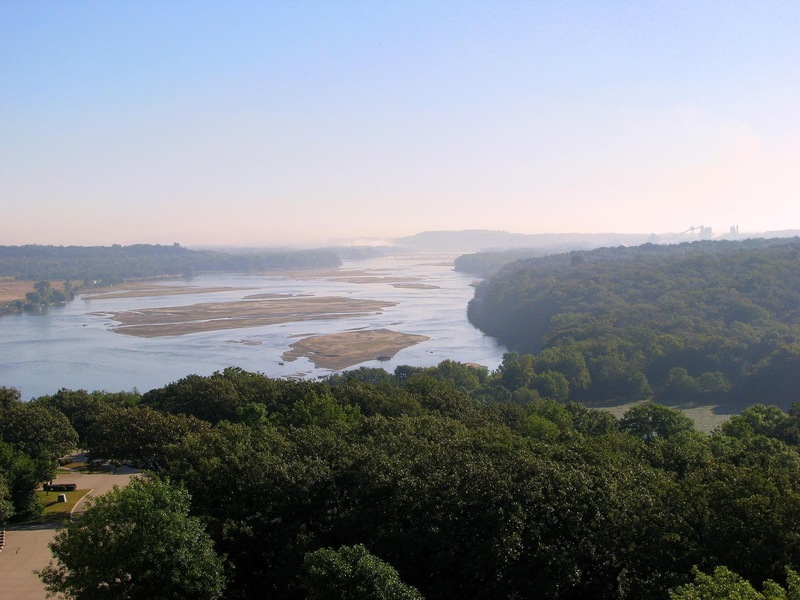 The Platte River was named by a French explorer who named the river the 'Platte' - French for 'Flat'. The state was later named after the river, namely the Oto tribe's word for the river - Nebraska. The park is about 40 minutes away from where I live. On Tuesday I stopped at park headquarters to pay the fee and get a map. I already had a hike description that I'd found on the internets. The hike would consist of two loops, both starting from Walter Scott Jr. Lodge. Before starting I climbed to the top of the observation tower near the lodge. The tower, some 85 feet tall, gives you a panoramic view of the area including the Platte River, the nearby town of Louisville, and the surrounding farmland. After taking in the sights from the tower, I headed north from the lodge and started on the western loop. Even though the loop is a relatively short 1 mile, it can be hard to navigate because of all the unmarked trails - mostly use trails - that spur off the main trails. This loop weaved in and out of civilization switching from cabin and camping areas and thick forests. I liked the forest parts and was pleasantly surprised when I heard something I hadn't heard in a while - a waterfall. Not Niagara Falls but nice and relaxing never the less. The falls were the best part of this short loop in my opinion. I left the falls and took a spur up a hill. Frankly the spur looked more like a trail at the bottom of the hill than at the top. The trail degenerated to a path through tall dew covered grass weaving through evergreen trees. By the time the trail came out to a picnic area, my pants were soaked. I sat on a swing and rested and let my pants dry in the sun while I got my bearings again. The loop returned to the lodge where I caught the eastern trail heading for the second loop. This trail takes you east following the river past cabins before dropping down a steep hill to the equestrian trails. This trail continues east over Decker Creek and up a wide dirt road. That is, a dirt road when it hasn't rained. The day before had been a rainy day and the road was slick with slimy mud. Getting up the hill was almost as hard as going down the hill. I did manage to make it without a fall. I left the road and took a biking/hiking trail that twisted and turned and twisted again up and down the hills through dense forest. I usually have a good sense of direction but the twisting trail really turned me around. I had a geocache stored in my GPS that was supposed to be on the trail. I never got any closer than 200 feet from it. I was so confused by the landscape that, before I knew it, I was heading away from the cache. I decided not to backtrack since I would probably be back someday and I'll get it then. The trail headed back up and emerged in a pasture where I picked up the muddy road again and headed back to the lodge. The hike was good enough. 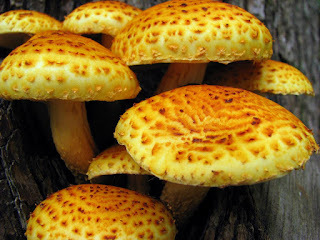 I saw deer, insects, mosses, lichen, and other animals and growths. The forest always reminds me of the woods I played in as a child. I spent some time trying to remember what made up a lichen (fungus and algae usually). It was a little short at 3.79 miles with about 700 feet of elevation change. I was a little disappointed that the trails never went to the shore of the Platte River. The train tracks run along the river and fences keep the trail away from the tracks and the river. During the three hours that I was on the trail three trains went by on the tracks. I did take some pictures. I left the park and went to nearby Louisville to get me some grub. I was disappointed once again when I didn't find a cafe. I ended up eating at a Subway. I should have waited. On the way home I drove though Springfield and passed Hazy's Bar and Grill. Now I know where I'll eat the next time I come through here. A trolly decorated like a train pulls out from a side street. Me: "I bet there are clowns on that thing." Me: "Mimes don't like trains." "Clowns like trains and little cars." You Know What This Means ? It means that on Saturdays I can only talk to the Wife during commercials. 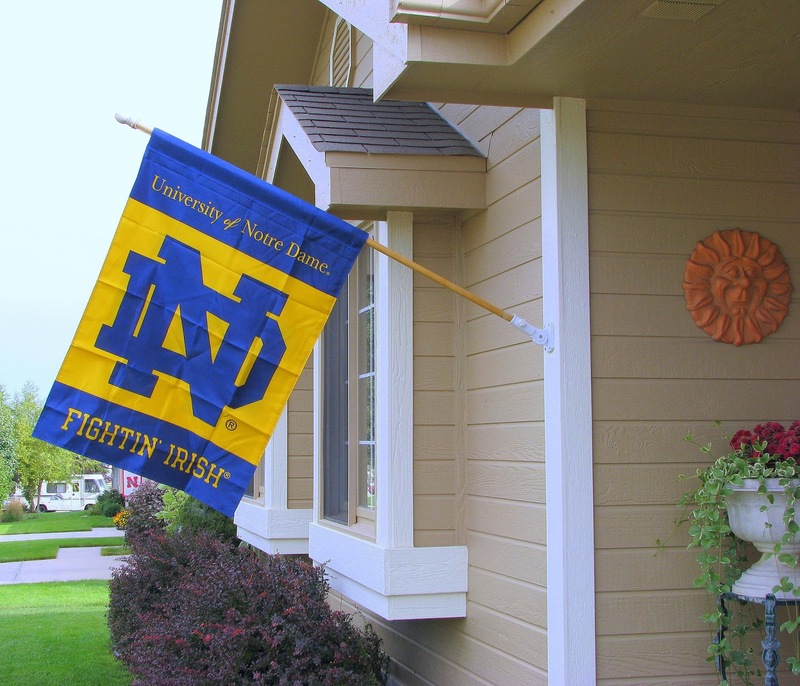 Note the the teeny tiny Nebraska flag cowering behind the mighty Blue and Gold of the Fighting Irish. 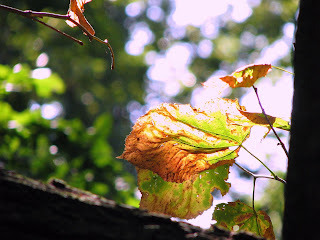 As I searched for hikes in the area, I kept coming across Fontenelle Forest. While investigating this park, I was getting the impression that it was geared more towards the kiddies than for serious hikers. Not sure I would find any challenging hikes, I made sure I had some geocaches in my back pocket as an alternative. To my surprise, it turned out I didn't need them. Fontenelle Forest is a located in the city of Bellevue, NE on the bank of the Missouri River and less than 20 minutes from my house. The park is on the west side of the Gifford peninsula. The eastern half of the peninsula is part of Gifford Farm, a working farm educational center not open to hikers. On Thursday off I went to investigate. I parked at the Nature/Visitor's Center and went in to get a trail map and pay the small fee to use the trails. The nice lady behind the counter pointed out some trails to me including a few around a marsh that she thought I might like. I asked how far it was and after discussing amongst themselves decided that it was about four miles one way. This surprised me. I'd thought most of the trails to be short - one to two miles tops - and a longer hike was exactly what I was looking for. I left the nature center and started out on the trail. The park is riddled with trails and are very clearly marked. There are 27 named trails crisscrossing the 1,400 acre conservation area ranging from a tenth of a mile to 1.3 miles in length. The path I took would take me along the Linden trail, the Hackberry trail, the Hawthorn trail, the Oak trail, the Signal Ridge trail, the Mormon Hollow trail, the Marsh trail, the Gifford Memorial Boardwalk, the Cottonwood trail, the Stream trail, the Missouri trail, the Hawthorn trail (again), the Chickadee trail, the Hickory trail, and, finally, the Riverview Boardwalk. On my last hike I commented how flat it was. This hike was not flat. Nebraska has some hills. Who woulda thunk it? The first six trails took me up and down forested hills - up and down four times. The path started as a three person wide dirt trail which, as you moved further away from the nature center became narrower and narrower until it became a single trace. The farther I went the more overgrown the path was as well. This was evidence that some of these trails weren't used often but the trail was never really hard to follow. As I went deeper civilization faded away. The only reminders were the sounds of trains and airplanes going in and out of nearby Offutt Air Force base and Eppley airfield. Never the less I felt alone. The Hawthorn trail takes you up and over the first ridge. After crossing a bridge, the Oak trail takes you steeply over a second ridge. The Oak trail ends in a gravel road that leads to the Hitchcock Wetlands Learning Center. Crossing the road you find the trailhead of the Signal Ridge trail that takes you steeply up over yet another ridge. All of these ridges are covered in thick deciduous forest. I imagine the trails will be totally awesome in the fall after the leaves have turned. I may have to return for some tree peeping in a couple months. Near the top of Signal Ridge I took a left turn onto the Mormon Hollow trail. This trail follows a wash down the side of the ridge. The path here was damp and muddy in spots and the plants along the trail were lush and overgrown. I imagine a lot of water washes down this trail during a good rain. Along this trail I stumbled on a letterbox (a precursor to geocaching). This was the second letterbox I've ever found - the first being on the old cabin trail. I don't have a stamp so I just signed the log. Maybe I'll make a Homer-Dog stamp and go back sometime to leave my mark. 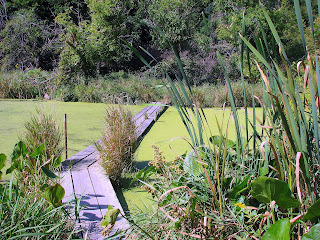 The Mormon Hollow trail crosses a train track before arriving a rickety three board wide bridge crossing an inlet to the Great Marsh, once part of the Missouri River channel. I don't recall a hike where the scenery changed so quickly. From hilly forest to boggy marshland. I had to pause to take it all in. This part of the marsh marks a ferry crossing used by the Mormons to reach the Fontenelle Trading Post on the Nebraska side of the river in the early 1800s. This park actually has three distinct areas with a prairie being the third ecosystem. I skipped the prairie as it would have added a little too much distance - another reason to return later. The great marsh area was very interesting as I'd never really hiked in a marshy area before. SoCal tends to be a little dry for this type of terrain. I stopped at an observation/birding blind and rested a bit. A couple of old birders showed up. At least that is what I think they were with the binoculars and cameras. The trails along the marsh and the river are relatively flat and mostly wooded. From the observation deck I headed toward the river following several trails including the Gifford Memorial Boardwalk, the cottonwood trail, and the Stream trail until I reached the aptly named Missouri Trail that takes you to the river bank before turning west and paralleling the river. The river was flowing at a pretty good clip. This trail took me closer to the bank than last week's Boyer Chute trail did. The Missouri trail eventually crosses the train tracks again and connects back up with the Hawthorn trail. To make the return trip a little different I continued straight at a junction and followed the Chickadee trail down to a creek in Child's Hollow before taking the Hickory trail to the Riverview Boardwalk. The boardwalk has interpretive signs with history and quotes from Lewis and Clark who figure prominently in many of the parks along the Missouri river in Nebraska and Iowa. It almost seems that all the parks in the area revolve around Lewis and Clark or the Mormons. 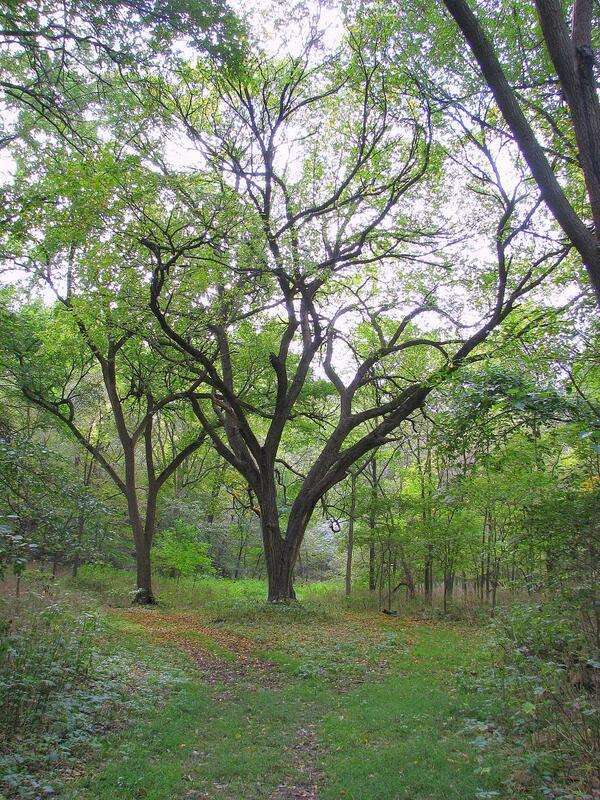 In the case of Fontenelle Forest, both influences are apparent. I was pleasantly surprised with this park. I was really surprised how such a wild feeling wilderness with such diversity was less than 20 minutes away from the hustle and bustle. I encountered more wildlife in this forest that any other I've hiked - six deer, three wild turkeys, various squirrels, a variety of birds, insects, and many spiders. Spiders. You could tell that there wasn't very many people on the trails that day because I kept running into webs stretching over the trail including one incident that caused me to do the big-spider-crawling-up-my-chest jig double-time. I also founds a Daddy-Long-Legs crawling up my stomach at one point which gave me a little start. All this heart stopping encounters just added to the richness of this hike. The hike ended up somewhere around 5.27 miles. It may have been longer as my GPS had some bad reception up in the trees and especially in Mormon Hollow which might have under-measured the hike. I doubt it was the eight miles they told me at the nature center. Elevation gain was about 426 feet but keep in mind that the hike topped four ridges so my estimate for total vertical is around 1,200 feet up and down. Pictures are here. Next week, another Mormon inspired park. This time in Iowa. While the Loon Whisperer was here, she commented that I had nice calves. At the risk of sounding vain, I think my calves are the best part of my physique. The worst part, in my opinion, is my chest and upper arms - wimpy and getting wimpier with age. I decided to try to correct this situation. I decided to attack my pecks and triceps with the venerable Push-Up. To assist me in this effort, I needed a plan and, thanks to the internets, I found one. The web site, hundredpushups.com, outlines a basic program to work your way up to doing 100 consecutive push-ups. It's very similar to from couch to 5k in six weeks ( I have no intention doing this program leaving the care of my calves to hiking and biking). I've been working this plan for just over two weeks now. When it was time to start week three I decided that I just wasn't quite ready to step it up so, based on the sites recommendations, I'm repeating week two. I'm blaming this on age. I figure seven weeks instead of six weeks isn't so bad. I will keep you posted to my success or lack thereof. Wish me luck.